We present the first study of the uncertainties associated with radiation belt simulations, performed in the standard quasi-linear diffusion framework. In particular, we estimate how uncertainties of some input parameters propagate through the nonlinear simulation, producing a distribution of outputs that can be quite broad. Here we restrict our focus on two-dimensional simulations (in energy and pitch angle space) of parallel-propagating chorus waves only, and we study as stochastic input parameters the geomagnetic index Kp (that characterizes the time dependency of an idealized storm), the latitudinal extent of waves, and the average electron density. We employ a collocation method, thus performing an ensemble of simulations. 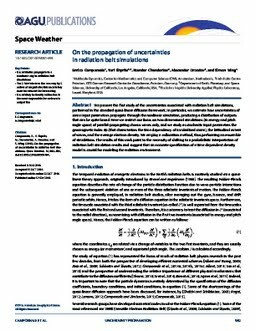 The results of this work point to the necessity of shifting to a probabilistic interpretation of radiation belt simulation results and suggest that an accurate specification of a time-dependent density model is crucial for modeling the radiation environment.